The use of rammed earth ties the home of a vintner to the terroir. 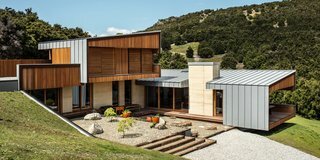 Embedded in the side of a valley in New Zealand’s Southern Alps, facing out over pristine Lake Wanaka, stands a new home meant to look as though it is part of the land around it. "It resembles the large schist rocks you see all over this region that are half-buried in the hillside and poke out at strange angles," says Andrew Simpson of WireDog Architecture, the Wellington-based firm that designed it.